Originally embroidered with modern dyed thread, apparently later decorated (at the time that the word SHEIKS was added) by hand with rhinestones in vintage metal bezels. Rhinestoning may have been done by a relative amateur, though with some good skill. A variety of sizes and slightly haphazard in-fill of stones. The Pharaoh also seems to be an older piece, applied later. Tassel clip is a standard rhinestone crescent with a crescent/scimitar pendant. An older fez. Temple name “Ballut Abyad” and emblem are embroidered in gold and silver bullion. Bullion is very bright and clean. Silver bullion is probably tarnished, but still very clean. Three larger red rhinestones set into clear plastic cups, which I believe might date this to the 1950s, maybe a tad earlier. An older fez. M.C. Lilley & Co. label style dates this to 1882-1925. Temple name “Aladdin” and emblem are embroidered in gold and silver bullion. Stitched in yellow thread above the first D of the name are rays of light, as from the eponymous lamp. Tassel is in a poor state, flies free. Fez is somewhat crushed from being rolled & bagged. Came with accompanying “The M.C. Lilley & Co” cloth bag. An older fez. 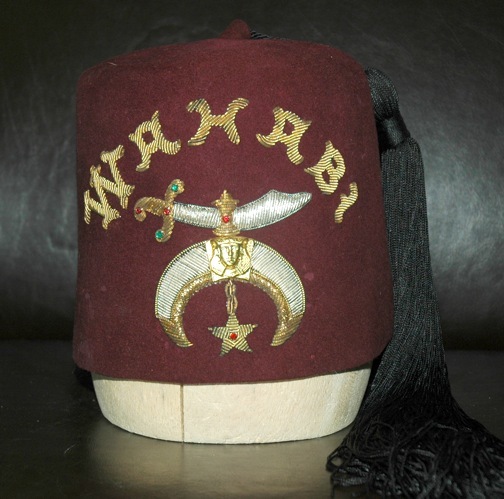 Very unusual in that the Temple name (Media) and the emblem are not embroidered or in rhinestones, but rather are each in solid metal pins or pieces, which have been attached, with brads, to the fez. Interior has a standard backing liner over the attachments, but the emblem of the maker is lost. All is secured except the star swings free. Emblem is cast, probably of pot metal; but temple name looks like it might be silver plated, now tarnished, and appears to be hand-engraved. Top of fez is not vented. Tassel is held in place by a much newer, basic “turban” tassel pin, with a crescent/scimitar dangling fob. An older fez with silver and gold bullion embroidery and a smaller pharaoh. A few small rhinestones on scimitar and star, set in metal bezel cups. I bought this because the temple is “Wahabi” and in this point in time that is very interesting. I got this fez cheap, perhaps for that reason. A somewhat older fez with gold and silver bullion decoration, a few small red rhinestones set into plastic cups which are yellowing with age. Tassel has no clip or other decoration. Stitching inside shows that “Brass Band” was added later. Emblem is a mix of yellow emboidery, with green velvet applique for scimitar, and metal bezel rhinestones. Sphinx head is small bead type. “Zenobia” is in cursive, with “BAND” in block caps. Extant stitching inside suggests there was previously a sweat band attached, which is now missing. Top is not perforated, and band on tassel is cloth with clear plastic bezel cups for rhinestones, which puts the tassel probably early mid century, though I suspect the fez is from the 20s or 30s. Backing of emblem and embroidery is covered with a dark red cloth panel, with maker’s information printed in black ink. Metal pin securing the sphinx head is somewhat corroded and has eaten/rubbed through this panel in 2 holes. An antique Mecca fez, exhibiting the original Mecca (and therefore the original Shrine) emblem, an upturned crescent with a downturned scimitar. Emblem is a mixture of embroidery and appliqué, with stitched thread detail. Emblem is bright, clean and clear. Appliqué crescent is still plush velvet. One one side there is a medal pinned, from the June 11th, 1901 Imperial Council Session at Kansas City. Medal upper portion is a scimitar through a crescent with a fez above. Lower portion is circular and shows a pyramid with “Ararat Temple AAONMS” on one side, and the Shrine emblem on the face. Braxman maker’s label inside shows a Scottish Rite eagle with a KT Cross/Crown above and a shrine crescent on its chest, a Square & Compasses below. Lot included a photograph of a man in the fez, see TAFC.2012.18. Emblem is in bullion with green silk appliqué crescent. Pyramid is in a metallic cloth with the ashlars defined by single thread embroidery. Remainder of the emblem is in bullion. 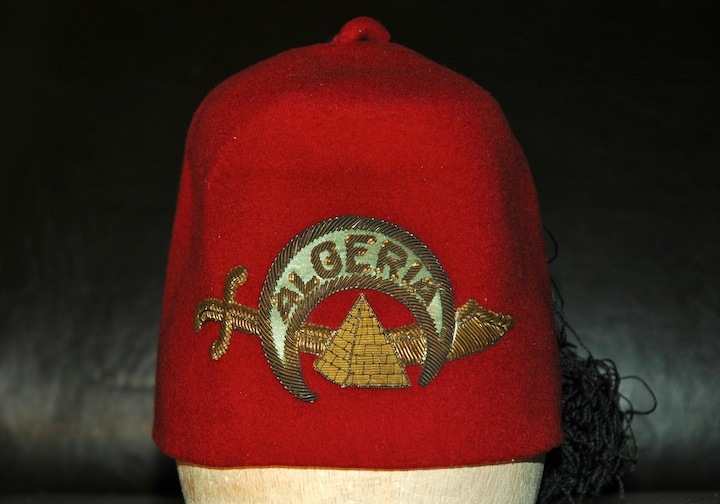 Algeria is the only Shrine that maintains its old, pre-Imperial emblem on its fezzes to this day. No leather band, not perforated. Maker’s label is overall illegible, from the Wendell-[Illeg] Co, Michigan. I have a great uncles Algeria lodge Fez. In pretty good shape, hassle attached and the label is fully intact and legible. Do you suppose this might be of any value? Karen, Thanks for looking and writing. Seeing that this little page gets to the “right people,” those who can maybe do something with it, is exactly what I hope for. Viz your family fez: monetarily, it’s unlikely to be worth any real cash. An old Algeria fez like I have pictured here, your average fell collector might pay $30 for it, or in that range. It’s much more valuable as a family heirloom. I display fezzes at home in lawyer’s bookshelves, with the glass doors, to keep them from getting dusty, and they’re fun, colorful, attractive, and conversation pieces. Believe me: a neat fez under a glass dome on the coffee table will elicit a “What is THAT?” from a friend or cousin or nephew, and you can tell them that it’s been passed down through the family. Algeria Shrine Temple is in Montana, and theirs is one of the few unique fezzes in the world of the Shriners, which reaches from Germany, to every state in the Union, to Japan and the Philippines. If your great uncle was a Shriner (so was mine, but his fez never materialized amidst the family, we don’t know that happened to it), it means he was not only a zany chap, he was contributing toward the upkeep of free children’s hospitals all over North America, helping kids with polio, burns, and debilitating spine and bone issues. Cherish that fez!